“Windows Server 2016” appeared on the market at the end of last year, in October 2016 to be precise. 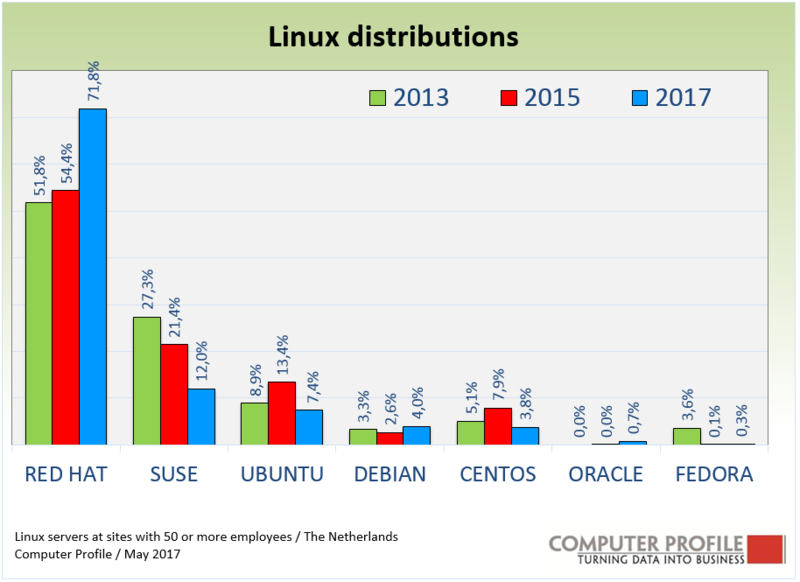 Since then, we can see that this OS has fallen by a couple of percentage points (about 2.5%) on the Dutch business market among businesses with 50 or more employees. We expect that it will certainly be another five years or so before this new OS will be the most used Server OS. The trend line of the Server OS-penetration of the other Microsoft releases shows that the business market is often slow to adopt a new operating system. Thus,.“Windows Server 2008” only reached its peak penetration five years after it was introduced. In 2013 “Windows Server 2008” was in use by approximately 55 percent of the aforementioned businesses with 50 or more employees. For “Windows Server 2012” too, we are still seeing a rising line in the percentage of businesses that indicate they use this version to the current 34 percent, four and a half years after its introduction. This percentage is likely to continue rising over the next year or two. This has emerged from an analysis by Smart Profile of about 2,000 interviews on the use of server Operating Systems. However, both “Windows Server 2008” and “Windows Server 2012” are nowhere near as popular as “Windows Server 2003”. Just as “Windows XP” on the desktop far exceeded its expected/planned life expectancy, “Windows Server 2003” too has been able to stick around in a large section the business world for an amazingly long period of time. Linux is the most common platform after Microsoft’s server operating systems. Approximately 12 percent of businesses in the target group use a Linux server. The peculiar thing about the use of LInux is that the percentage of businesses using Linux servers continues to hover around 10%. Sometimes a bit below that figure, and a bit above over the last few years. We still find UNIX systems in about 1.5% of the locations. This rate has gone virtually unchanged over the past 3 years. These will be proprietary systems that simply cannot be converted into a newer platform. The same goes for OS/400 systems, which we still find in approximately 3 percent of the locations. Here too, little has changed over the last three years. In the public domain, which therefore covers the government, educational and healthcare institutions, “Windows Server 2012” already occupies a greater position now than “Windows Server 2008. The same goes for businesses in the Medium Sized Businesses segment, which covers companies with 50 to 250 employees in The Netherlands. Multinationals seem to be more cautious. “Windows Server 2008” still has a clearly greater rate of spread in this segment that the newer versions. The use of Linux in the various segments is largely at a comparable level. The exception to this is the public segment, where find one or more Linux servers in use among 15% of the locations. In the public domain this percentage is highest among government bodies, where one in five locations uses Linux servers. Looking at the use of the various server Operating Systems according to category of size (of the location) shows that the use of both Linux and UNIX systems centres more on the upper side of the market than the somewhat smaller locations. Thus the proportion of Linux used by locations with 50 to 100 employees is seven percent, and among locations with more than 1,000 employees about 26 percent. The intermediate categories bridge the gap in stages. Businesses with UNIX are most to be found in the segment with 500 to 1000 employees, with 6%. These are mostly government locations and locations in the “ICT & Utilities” segment. Of all the locations interviewed, barely 12 percent of them indicate that they useLinux. But Linux is Open Source and thus appears in many guises. Looking at the total volume of Linux operating systems that we come across in the locations we surveyed – thus taking account of the number of servers Linux operates on – Red Hat remains the main distribution for the business market. Of all the Linux servers encountered by Computer Profile, more than 70% is a Red Hat version. It is also the most common version amongst the larger IT service providers when customers opt for Open Source servers. Suse Linux has meanwhile been acquired by Micro Focus, which also took over the software activities of Hewlett-Packard Enterprise in the second half of 2016. All the other Linux distro’s have a share of less than 10 percent.